The new songbook is now updated for Hindi. Schedules must have a start date of 7th January 2019 or later. The new songbook is now updated for Saramaccan. Schedules must have a start date of 7th January 2019 or later. The backup / restore feature has been improved and now supports progress monitoring. The Select Student window has had an important bug fix. It was showing the wrong information under certain scenarios. Please let me know if any of the revised slips above become available. Ideally I require the single slip PDF document to make the template. 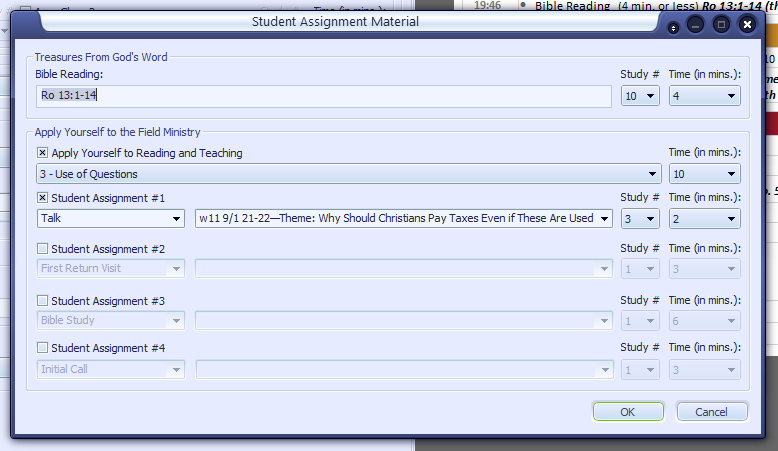 Some users were getting confused with the Apply Yourself to Reading and Teaching assignment and the first week of the month. This information is usually filled in by monthly volunteers. Hopefully the slight adjustments I have made to the window will make things clearer for both users and volunteers. 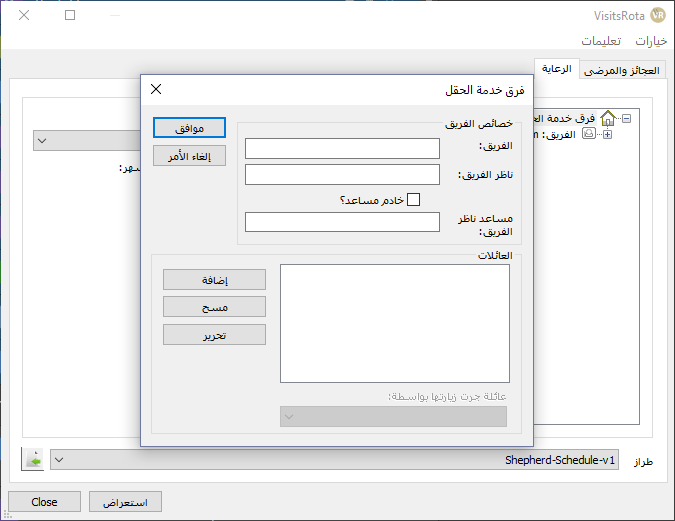 Several improvements have been made with respects to date formatting and localisation. 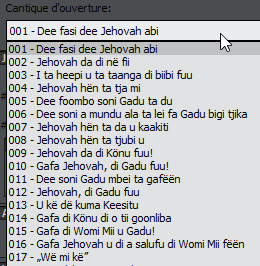 The application now supports genitive months. This affects specific languages, like Polish. 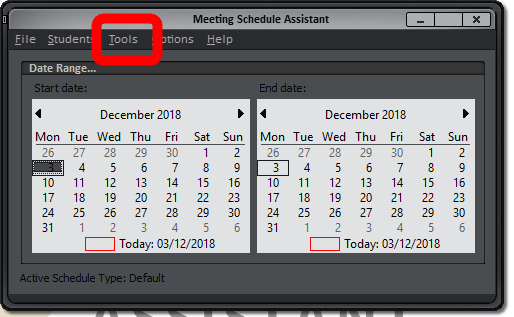 The application now displays dates without cropping. The application now supports additional date formatting specifiers. However, please note that a small handful of languages can’t use these new formatting codes – see the help topic for details. 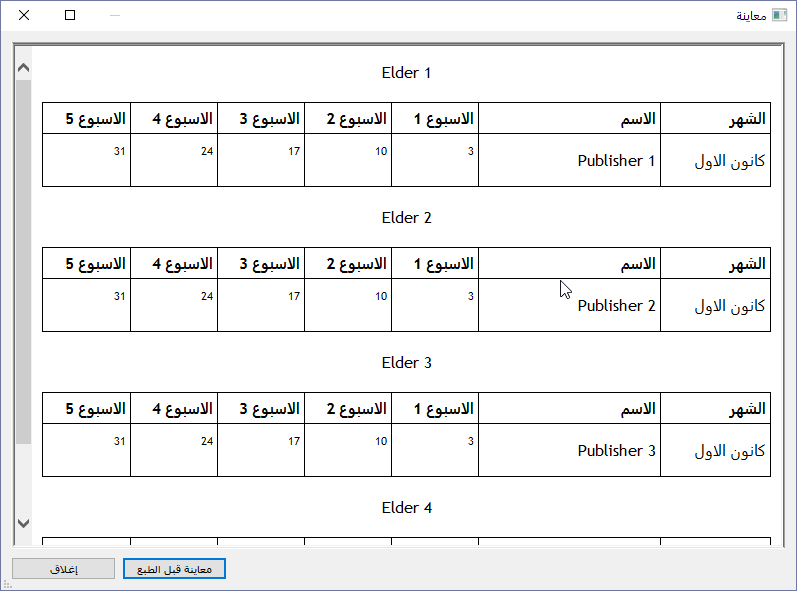 Please see the 19.0.3 Newsletter for the latest status about the S-89 10/18 templates in various languages. 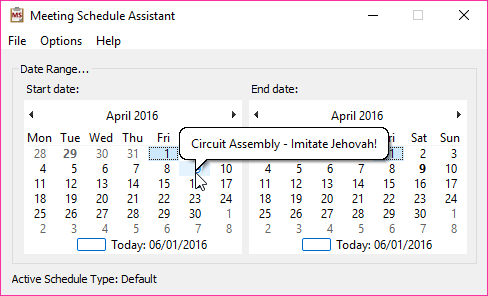 I am pleased to announce that there is a new version of Visits Rota available. I would like to thank our translator for coming forward to do the translating and proof reading. It has been many years since I made any changes to the Visits Rota application. I felt it was about time! New Check for Update feature. 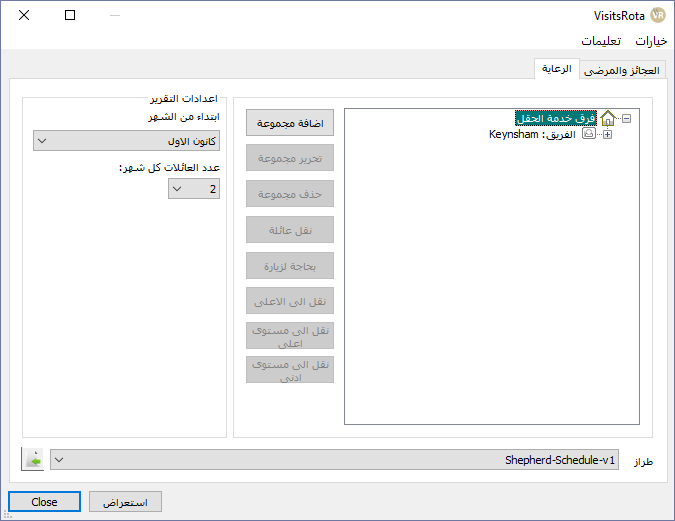 Can be started from Meeting Schedule Assistant (version 19.0.3 or higher). One of the key things is that VisitsRota now uses the same XML / CSS / XSL functionality so you have full control over how you want the reports to look. You can start an instance of VisitsRota from this menu. You need to have VisitsRota version 19.0.0 (soon to be released) installed for this feature to be enabled. 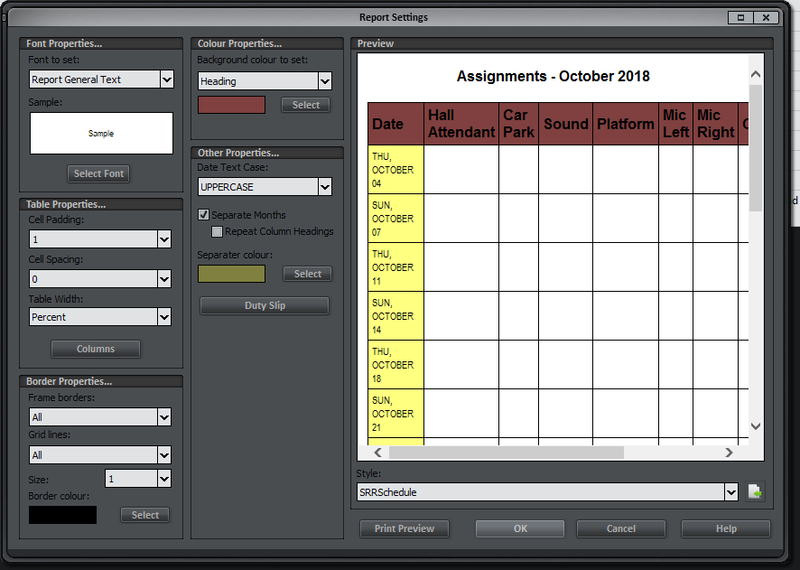 Also, the Assignments Editor has had a major overhaul. 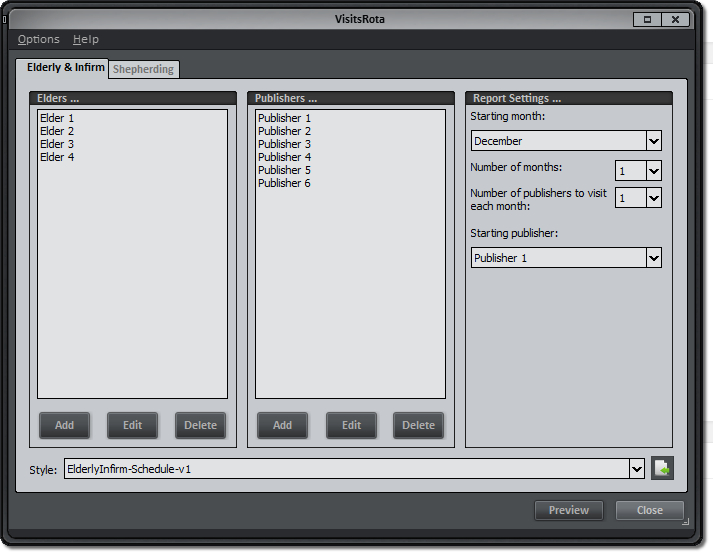 It now uses the same XML / CSS / XSL functionality as the Midweek Editor. The possibilities for customising the look and feel of your schedules is now virtually endless. 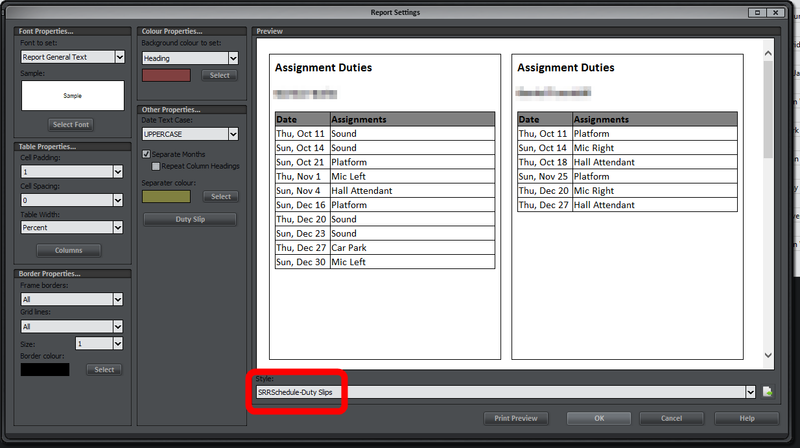 You can still customise your reports like you use to, but now it is very easy to override or extend this. The above window is now called Report Settings (instead of Export Settings) and can be found on the new Edit menu in the Editor. Multiple slips per page (if you reduce your margins enough). Since these slips are also using the new XML / CSS / XSL functionality there is nothing stopping you making further refinements to meet your needs. 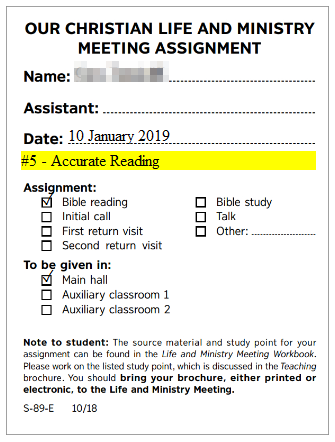 I have decided to show the study number on the slip (even though it is stated in the Meeting Workbook). 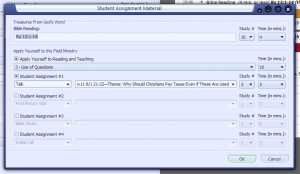 This is so that the student will know which of the student items they have been assigned, since there are multiple assignments of the same type on the same meeting. 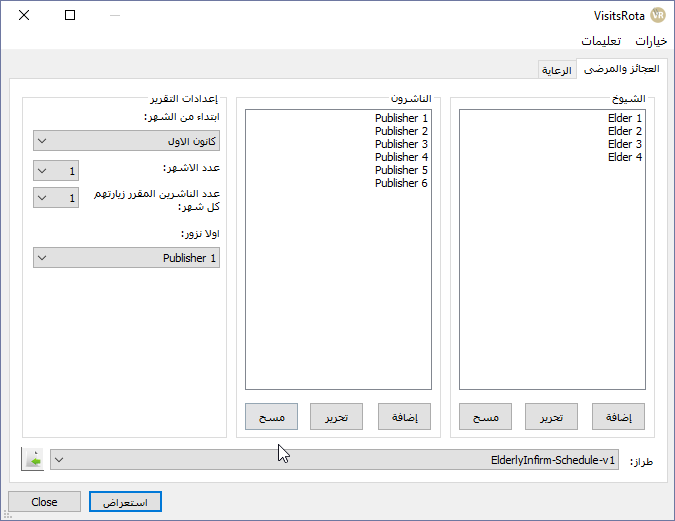 Templates will be updated for other languages as soon as the updated slips become available. Users of the software are required to send me a copy of their S-89 Slip by email and I will supply the templates in return. There are several other minor improvements to the software. Please see the Revision History for full details. I have updated the documentation to take into account the new features in the software. Advanced customisation can be daunting so feel free to create a feature request on the Mantis BT so that I or someone else can assist you.